Good morning crafty friends! Today, I wanted to give you a little sneak peak of a project I have up over on the DCWV blog today! Valentine’s day is just around the corner, and while I am a huge fan of chocolate, I thought it might be fun to try something a little bit different! Cookies sleeves!!! 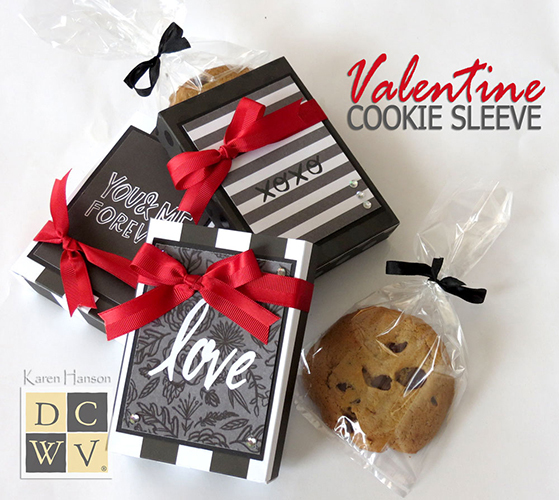 Whether you make your own or pick some up from your favourite store or bakery, these little sleeves will make you want to give yourself a little Valentine treat! This stack is called Jet Black and it is available at Jo-Ann Fabric and Crafts. Come on over to the DCWV blog for details! And if you love it as much as I do, I created a card earlier this month for May Arts for our Cardmaker hop that you might want to see! This entry was posted in DCWV, Treat Container and tagged cookie sleeve, DCWV, May Arts, treat, valentine's day by Scrappy Canuck. Bookmark the permalink.